Sindhishaan raised the banner of protest against the threat of demolition of homes faced by the residents of Ulhasnagar last year and created wide awareness vide its publication Volume 4 issue 3. It was not Sindhishaan alone that expressed solidarity with the Ulhasnagar residents but a number of Sindhi organizations and individuals from the community who took up cudgels on behalf of the affected. With the efforts of Shri Ram Jethmalani the issue was subsequently resolved but not before 'RAANI MAA' was partially demolished and 21 families rendered homeless. It is a matter of shame and regret that I have to report that beyond paying some lip-service, all the well wishers seemed to have lost interest in the plight of those families, out of which three are shelterless and occupying their flats in 'RAANI MAA' without walls, electricity and water with the constant fear of the collapse of the building itself, and at the mercy of the elements. I salute Shri Prem Lalwani, Chairman, Alliance of Sindhi Associations of America Inc. who had visited Ulhasnager after the conclusion of the 12th International Sindhi Sammelan in Mumbai, and brought this to the notice of “Forum for Social & Political Rights of Sindhis” which was formed at the Sammelan to follow up and implement decisions taken at Sammelans. Incidentally this was also a concept mooted in my editorial of Volume 4 issue 4. The Forum, under the leadership of Shri Ram Jethmalani immediately rushed to the assistance of these destitute families and provided them with spot relief by providing alternate accommodation. It is also proposed to reconstruct/restore the entire structure and the Forum is presently considering the options and possibilities. 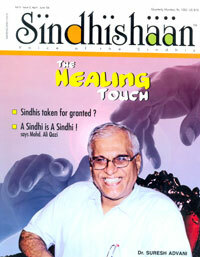 In the same vein the Healing Touch of Padamshree Dr. Suresh Advani is not an unknown phenomenon and Sindhishaan is proud to have him on the cover and present his visionary project in this issue.